Tungsten Analysis: WC Preview Part 3 - Three more world finalists! A nine dart legend! The future of the sport? WC Preview Part 3 - Three more world finalists! A nine dart legend! The future of the sport? 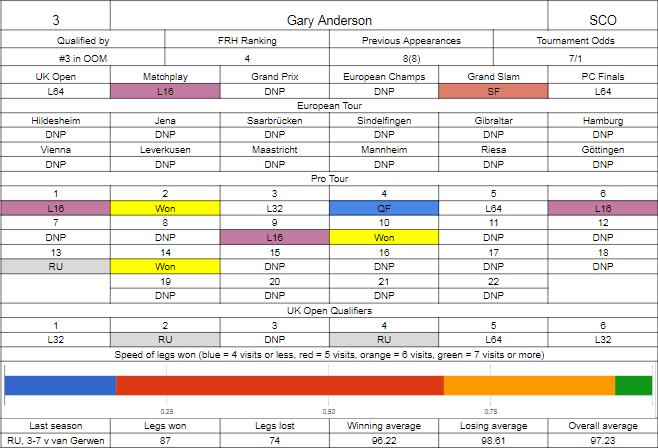 If you had said to me at the start of the year that Gary Anderson would only make one major quarter final, I'd probably have thought for a split second "well, he's not playing the European Tour, so that's one less chance" before laughing uncontrollably. But that's exactly what has happened, and while the Grand Prix withdrawal was out of his control, you'd still think he could have done better than that. A shock loss to Paul Hogan did for him in the UK Open, while Daryl Gurney's upsurge in form was to be his undoing in the Matchplay. If anything, Mickey Mansell knocking him out of the first round of the Players Championship Finals was more of a surprise than the loss to Hogan, I think most people would agree that if Hogan was to have switched a couple of years ago he'd have been more productive than Mansell's been. He did reach the semi finals of the Grand Slam, losing by the odd leg in 31 to Peter Wright, and his floor form has generally been pretty solid, claiming three titles and reaching three more finals before switching off the floor circuit completely as the World Series exbo tour kicked off. He might be a little rusty, but should have a couple of rounds to dust things off, you'd think. That said, the preliminary qualifier he'll play won't be the easiest. 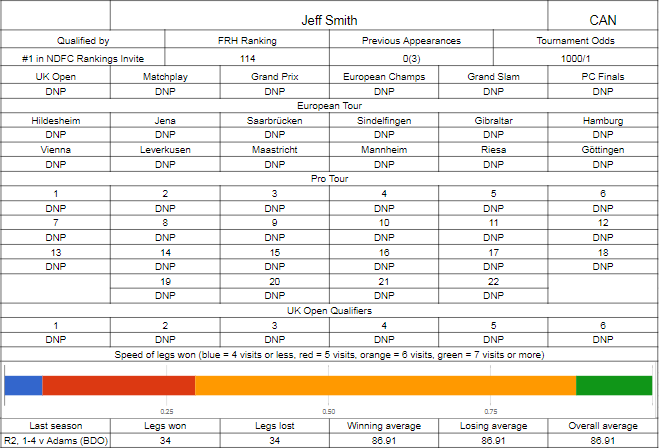 Looking at Jeff Smith first, everyone should know who he is from his BDO exploits, as the Silencer makes his PDC worlds debut. The Lakeside finalist in 2016 (losing to Waites) and semi finalist from the year before (losing to Mitchell) has played some PDC before, obviously most recently in the 2016 Grand Slam where he got out of his group by edging Simon Whitlock in the final game and taking five legs off Phil Taylor in the first knockout round, but he did also have a brief punt in 2012, winning through Q-School but not really being able to commit to the tour properly, limiting himself to a small number of floor events and playing in the World Cup with John Part. This season in the BDO he didn't qualify for Lakeside and didn't have an exemption either, so the PDC snapped him up, but he did take the recent World Cup and was able to make the last 16 of the World Trophy. 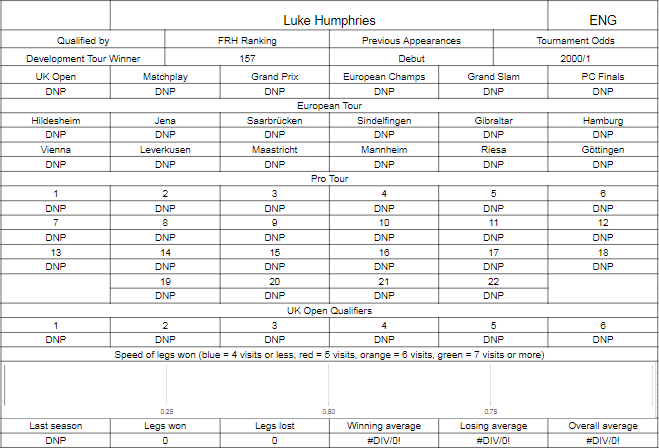 Luke Humphries we know less about, but he's a very highly rated youth player who has managed to win five of the twenty Development Tour events to win that order of merit quite comfortably, which has given him entry to the worlds and, for next year, a tour card to play the senior circuit properly. He's also been playing the Challenge Tour, where he managed to win the twelfth event, beating amongst others, former world youth champion James Hubbard and multi-time major player Andy Smith in the final. He was close to getting what could have been critical stage experience in the world youth himself, but the number 2 seed lost out to Dimitri van den Bergh in a deciding leg where reports say he had a dart to win it. The prelim is your typical youth versus experience matchup. Humphries has gained a bunch of match experience this season and done very well in it, but this is a whole different setup to what he will have been used to, while Smith has been playing at a solid level for quite some time and will be used to the big stage environment. I doubt Humphries will be intimidated, none of the kids these days seem to be, but it may take him a short while to get acclimatised, by which stage he could already be a set down and in a race to two, that could already be too much ground to make up. I'm not sure either can really challenge Anderson, but this isn't an auto-win by any stretch of the imagination and either qualifier taking a set wouldn't surprise me in the slightest if Anderson has a slow start. 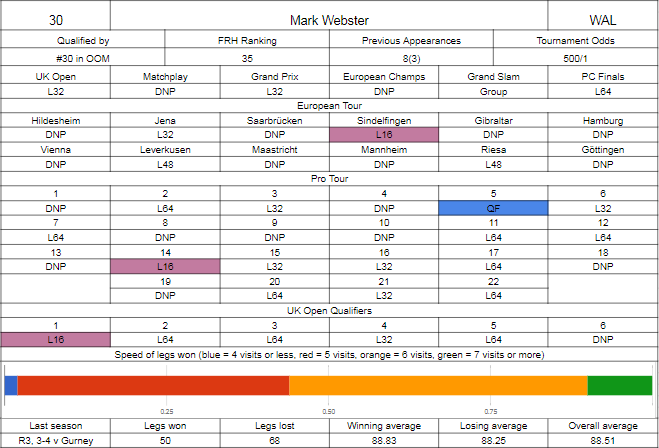 It seems quite some time ago that Mark Webster has truly been in form, but he always seems to turn up to this event as he looks to make a third straight last sixteen appearance. He kicked off the season pretty well, cashing five of the six UK Open qualifiers, and in the main event was able to successfully navigate an awful round before the money draw in Stephen Bunting, before seeing off Ross Twell in a match that went the distance, before losing comprehensively to Daryl Gurney in the last 32. He'd follow that up less than a month later with his only quarter final of the season, mainly due to a favourable draw I think as he got whitewashed by Chisnall once he got there, and the following month he had his only notable run in Europe, edging out James Wade to make the Sunday before a heavy defeat to Jelle Klaasen. Only two more European runs would follow, both first round defeats to James Richardson and Max Hopp, his floor form was nothing to write home about, but he did at least help Gerwyn Price get Wales to the World Cup final, which got him into the Grand Slam, falling at the group stage, and was able to play Dublin as an alternate, but on very short notice he lost to Richard North in the opening round. His only other major appearance saw him lose in the opening round of the Players Championship Finals to Justin Pipe, so his form isn't great and with him defending a few quid he needs this win to help stay around the top 32. Lim needs no introduction, with this appearance taking him to double figures in world championship appearances on each side of the divide, and he's here having won the south/west Asia qualifier. Still playing high quality soft tip, winning an event in France this year, he's also keeping his eye in on steel tip, being part of the World Cup team that knocked out Peter Wright and Gary Anderson in the opening round, then whitewashing Alcinas in round two, and it needed a 120+ average (over five legs) from Kim Huybrechts to stop him taking them further. He missed last year's event, and the previous year failed to come through a preliminary, losing a deciding set to Alexsander Oreshkin. 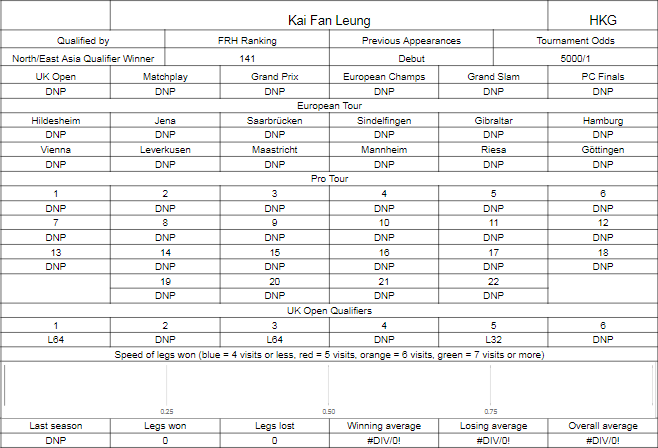 Leung is an interesting one - his dartsdatabase record is very limited, with nothing prior to this season's Q-School, where he didn't do much except on the final day, reaching the last 32, losing 5-0 to Jimmy Hendriks but beating former BDO world youth winner Colin Roelofs to get there. He did stick around for the UK Open qualifiers, and did OK - he qualified at least with three cashes, one reaching the last 32, and in those qualifiers he beat some names you may know - Royden Lam, Jamie Lewis, Ronnie Baxter, Madars Razma, Ronny Huybrechts (6-0), while in the event proper he lost 6-1 to Jermaine Wattimena in the opening round. He won the opposite Asian qualifier to Lim, and has been on stage previously this year teaming with Royden Lam in the World Cup as Hong Kong lost to Russia in the first round. This prelim's tough to call but you've got to fancy Lim just based on experience if nothing else - while it seems like Leung is new to the scene, he's actually as old as I am and I can remember seeing Lim's nine darter. It's possible Leung may be overawed by the occasion and you have to think there's a non-zero chance that he sees Lim as someone he respects, maybe too much. Webster's form is quite concerning, but I think he should just scrape through this one, although him going out wouldn't be a surprise if his opponent can score enough to limit the amount of shots at double he has.